The new Meriva, pictured, is an all-new vehicle based on a shortened version of the GM's Delta architecture. RUESSELSHEIM -- Opel/Vauxhall is offering innovations such as rear-hinged rear doors to help its new Meriva retain its position as Europe's best-selling small minivan. The Meriva's rear doors, which are a first in the segment, open up to almost 90 degrees -- much wider than conventional doors -- allowing easier access and easier cargo storage. Opel calls the door system, which it developed in-house, FlexDoors. The company's engineers developed a safety system that ensures the doors are always latched and locked whenever the vehicle is moving at speeds above 4kph. The Meriva has other versatile functions such as FlexSpace, a seating system from Johnson Controls Inc. that's improved from the first-generation model and enables the rear seats to be more easily folded flat for cargo storage. FlexRail provides storage in the center console for everyday items with the amount of space boosted by making an electronic parking brake a standard feature. FlexFix is a bicycle carrier that slides in and out of the rear bumper like a drawer. The new Meriva is an all-new vehicle based on a shortened version of the General Motors Co.'s Delta architecture that also underpins the larger Zafira minivan. 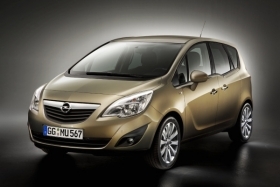 Unlike its predecessor, the new Meriva was an all-Opel project, and it will only be sold in Europe. The last-generation Meriva was co-developed with GM's Brazilian subsidiary and is also sold in Brazil, Mexico and Argentina under the Chevrolet name. In 2009, sales in the small minivan segment fell 4.8 percent to 440,222 units out of a total European market of 14.8 million, according to market researchers JATO Dynamics. The Meriva kept its lead despite strong challenges from the Citroen C3 Picasso ad Renault Modus. Opel expects that the second-generation Meriva won't reach the volume of 210,000 sales realized by the first-generation model in 2004 because the segment is now more crowded. The company aims to sell 130,000 units of the new Meriva in its first full year of production. 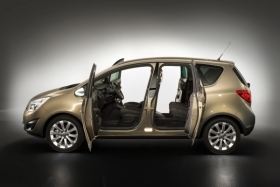 The Meriva's rear doors, which are a first in the segment, open up to almost 90 degrees. The minivan is targeted at families with young children as well as older empty nesters. The new-generation Meriva is 170mm longer than its predecessor at 4220mm and 55mm wider at 1760mm, making it quite large for a small minivan. The model has grown to allow more rear seating space and storage capacity, which are in demand from both its target groups who increasingly have more active lifestyles, said Nathalie van Impe, an Opel spokeswoman, at a press event in Ruesselsheim. Engine choices start with a 95-hp, 1.3-liter gasoline powerplant and a 75-hp, 1.3-liter diesel unit. Fuel-saving stop-start technology will be available next year. Annual production: 145,000 installed capacity. Average annual sales forecast: 130,000. Base price: 15,900 euros (Germany). Best bits: Rear-hinged rear doors allow passengers easy access without having to twist over the wheel arch.